I thought I'd share the technique I use to prepare very thin emulsion and japanese paper, onto which I print digital pieces. These either become prints in their own right, or become part of a larger collage. As a base (and for something sturdy that will go through the manual feed on my printer) I use flexible cutting mats that come from the grocery store, and brush on a thin layer of Golden Soft Gel Gloss, spritzed with a bit of water. 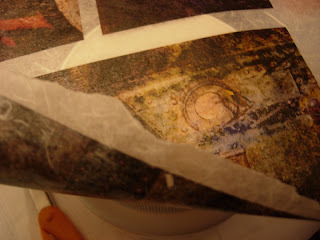 Then I layer various thin papers and cover them with a light brushing of gel medium as well. When this has completely dried, I brush on one or two thin coats of clear InkAid. This is a coating that allows ink from your inkjet printer to adhere nicely to the emulsion. Golden has a new line of digital mixed media products coming out which will work much in the same way InkAid does, so that is an option as well. Once that has dried completely, I put it through the manual feed slot of my printer, and print my image. 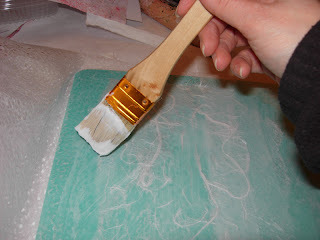 When finished, I very carefully peel the emulsion/paper off of the cutting mat. 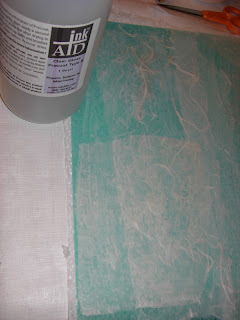 The result is a very thin, translucent piece ready to finish up, or incorporate into a collage. That is magic. I just made a vow not to get new supplies, but o my. Thanks for the little demo.